The Concorso at Villa d’Este on the shores of Lake Como has being on my ‘bucket list’ for sometime, and in 2013 the stars aligned and allowed for a visit to the event the week following the Mille Miglia. Cernobbio, Lake Como, Italy – a glamorous setting in itself, then mix in 49 of the world’s best hand-picked automobiles from years past and a set of concept cars being unveiled to the world by leading car manufactures, lus an auction setting world record sale prices, and you have this awe inspiring three day extravaganza. Following a couple of nights in Mulhouse, France, which included visits to the Citie du Train and Citie de l’Automobile “Schlumpf Collection”, I travelled through Switzerland via train on what became a perfect day weather wise (blue sky above the snow capped hills) and arrived back to Como and took a ferry across the lake to the town of Cernobbio, my home for the next four nights. The exploration of the town was to find my bearings of venue locations, and as importantly, places to drink and eat! It was not long, following a very nice lunch at Harvey’s Bar that I stumbled on Villa d’Este, only a five minute walk from the town centre. Blue skies still prevailed at this stage, and the security guard let me in following confirmation that I was to collect my media credentials. The location for collection though was not clear, so I found myself roaming the grounds of one of Italy’s great estates, during which I spotted a gardener standing back from a garden bed of perfectly arranged rose bushes, studying them, presumably to make sure they were all in perfect order. Immediately behind the Grand Hotel was where I found the sounds of engines and had stumbled upon the car registration area. Here I was advised that the BMW Group Media Lounge was located in another building, so unfortunately had to continue strolling the grounds! A moment though to reflect on the first car I saw at the registration area at this point, Ralph Lauren’s stunning Bugatti T57 SC ‘Atlantic’. No Ralph in sight, but to see, hear and wander around the most prized automobile in the world – undoubtedly, was an experience I thought I would never have. Before this trip I was content with looking at my 1:18 scale model of the car at home. In the stroll I found myself walking past the front of the Grand Hotel and past the area where the 49 cars would be parked on Saturday before their inspection of the jury. I eventually found the media lounge, but was advised that I could not pick up credentials until Friday at 14:00 hours. As I hadn’t being thrown out of the venue, I chose to stay around and continue my wander, soaking in all of the scenery I’ll most likely not get the chance to see again for a long time. This is when I came across a car with the numberplate Vic1777 and thought, I know this car. It was the Best of Show winner at the 2012 Motorclassica in Melbourne, Australia, the Bentley Continental R. A stunningly restored and prepared car that had just arrived via London, air-freighted in by Gibson Freight. Unfortunately, on arrival into the UK the car was left outside with its bonnet up and had suffered from rain water corroding some engine parts. Some unnecessary detailing work to be done if the car was to stand up to others in the Concorso. This is when, by now about 3:30pm in the afternoon that the clouds started to roll in, following by drizzle, which was promptly followed by steady heavy rain for over an hour. As I was in shorts and t-shirt, quickly sought refuge under the side awning ofa trailer near the main entrance gate. Inside the trailer I found a highly original and well prepared BMW M1, the only one I was told that is in the colour grey. This is where I met a German-based Englishman, Rofer Scott who looks after the collection of a German packaging tycoon. Before his drive down from Frankfurt, he had spent the previous 3 days of solid preparation of the car, which is not used as a ‘show’ car. This included getting the 33 year old starches out of the original paintwork, which started with an intense machine polish, followed by hours and hours of hand polishing. The car looked brand new. I learnt from Roger that he is not in the car preparation business as a professional, but is a truck driver by day and spends his spare time on this car collection. I heard some amazing stories about McLaren F1 road cars, deliveries to high profile people, and much more, all of which I choose not to share in this article. Roger finally decided that the car was going to get wet and he would take it out of the trailer, so as the rain continued I sought further refuge at the security office at the main gate. Had a reat conversation here with the Italian, who spoke little English, but did manage to teach me quite a lot of Italian words, most of which I have not retained, but apparently when repeated back at the time it sounded pretty good. With the rain easing I chose to leave and head back to the hotel to change into some more appropriate clothes and find a bar. I had grand plans on Friday to catch a ferry up the lake to the township of Lenno, have some lunch, then travel back for the 2:00pm credential pick-up. Before this though was my first visit to the Villa Erba, which was conveniently located at the end of the street where I stayed (albeit, I was right down the other end!). this visit was to collect the media pass for the RM Auction. The funny events that led to me gaining entrance into Villa Erba were at the two gates. I went back and forth a couple of times as is guard directed me to the other, mainly as I did not have a pass. Finally got the message though that my pass was waiting for me inside! Following collection of this inside the exhibition building. A very bleak day of low, dark clouds and drizzle, but I chose to wander the grounds of the Villa Erba and found first the motorcycles entered in the motorcycle Concorso, the setting up of the inside located BMW Motorad, an exhibition celebrating 90 years of the BMW motorcycle, and finally the raised platform where the auction cars were located, and fittingly by the lake were the two Riva boats on stands, two Lots in the auction. Looking out over the lake I chose to ditch the aforementioned ferry trip plans as I was not going to see much with the weather like this. But instead, extended my stay in the grounds of Villa Erba, had a wander around the outside of the Villa Antica (main historic building in the grounds) and continued watching the auction cars arrive. Knowing that Germans stick to time schedules, following lunch I made my way to Villa d’Este to pick up the credentials from the tent that they had located beside the entrance gate. The two very nice girls here were not entirely ready for people, so suggested I have a wander and come back after 2:30pm. 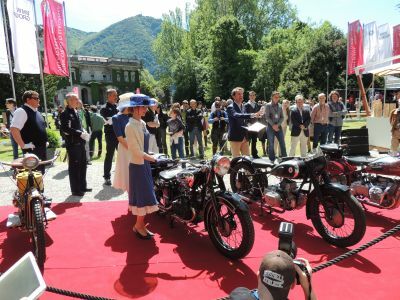 My wander found me back past the Grand Hotel building, where again behind a number of participating Concorso entrants were arriving, and viewed the setting up of a Rolls-Royce display. This included the Centenary model of the Silver Ghost. A four-door saloon in ‘light blue greyish’, silver and black radiator & wheels. Here I met and had a long conversation with the General Manager Bespoke – customised Rolls-Royce, Lars Klawitter It was he who confirmed that the James Radley 1913 Rolls-Royce Silver Ghost is what this Centenary model is based on, and yes the term ‘light blue greyish’ as the main panelwork colour is what is written as the colour in the original model book! The other detail of the black grill & black wheels are to represent those on the veteran, as too to the silver bonnet. By the time he had explained this, and that the current custodian of the Radley car was due to drive in at any moment following the 1,100km drive from the UK, the 1913 example arrived. 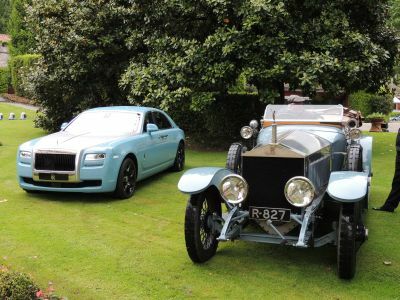 In a separate area of the estate Rolls-Royce had rented a Villa and surrounding grounds in order to provide space to unveil the new model ‘Wraith’. This is a 6-metre long fastback model. Quite a stunning car, with Lars advising that more than 130 deposits from the Middle-East alone have being taken, production commencing August 2013. I drew myself away from this, and this is when the fun started! I arrived back at the credential tent where others were present collecting their passes. My name though, was not on the list, so I handed over the print out of an email I had received confirming the accreditation. 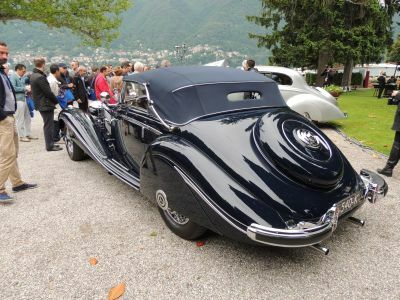 Following a phone call to the main media office I was advised that my credential had only being approved for the Sunday events at Villa Erba, and not the Concorso events at the Villa d’Este on the Saturday. Gutted that I had travelled all the way from Australia to attend Villa d’Este, I asked if there was something I had not filled in correctly and how I could go about rectifying the issue. A visit to the Media Lounge (where I had attended the previous day) followed, and the 24-hour flight sob story to the two very nice ladies here took place. They said that they would see what they could do & phone me within 30 minutes. 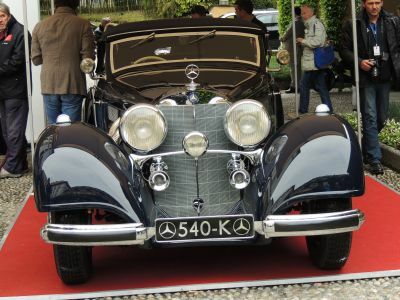 I sooner found myself back at the registration area where I viewed an immaculate BMW 328 and Mercedes-Benz 500K & 540K. The phone call came, and to my absolute delight they had managed to make my week by advising that I could attend Villa d’Este on the Saturday and could pick up the a few minutes later. To say I was relieved is an understatement, and the smile on the face was huge. 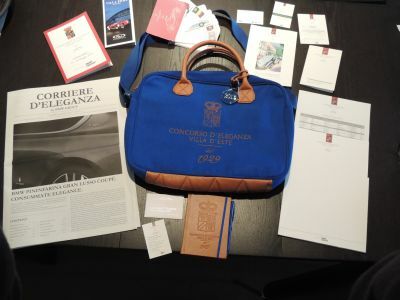 The pass included supply of a carry bag, inside it a lot of goodies including a Villa d’Este logo embossed writing pad and pocket (large pocket) sized catalogue of the Concorso & Concept car entrants. 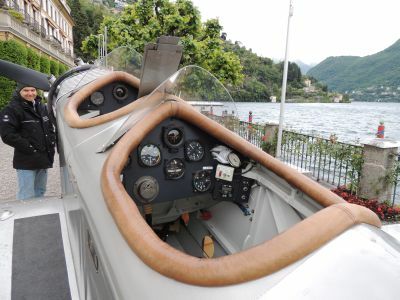 The afternoon continued with the viewing of many more vehicles arriving, and the arrival of a plane from Germany (by trailer), which was being put together and started on the lake side of the Grand Hotel – when started it had a strap holding it back, strapped to a nearby tree! Saw quite a lot of vehicles coming out of trailers, but the one of note was the Ferrari 212 Barchetta. Absolutely stunning, and when it was being winched out of the trailer I found myself standing next to the American owner who said to me “this is the first time I’ve seen this car”. This had followed a two-year restoration. It turns out though that this fellow has quiet a vast collection (a prerequisite it seems for all entrants here), including a couple of bomber aircraft, one of which he flew in WWII, and two further Ferrari cars – the 1950 & 1951 Mille Miglia winners – amazing stuff. A Subaru “Concept Car” was also unloaded from a closed trailer. This car was an SUV Hybrid. Interesting, but a very experimental move for an event that usually showcases sports car concepts. The next truck along the driveway remained closed and when I questioned the German driver he declared he was sworn to secrecy as the car would be making its world debut that night. It turned out to be the BMW Concept Car for the next generation 6 series. A quick wander back to the front of the Grand Hotel building was next as I followed a noise, which distinctively sounded like an aero-engine. In the narrow 10 or so meters from the front of the hotel to the shore-line was a German plane warming up! It had just arrived by trailer & its minders had hooked a rope around the tail and a nearby tree so that they could warm it up prior to later moving it along the way & fitting the wings. It turned out to be a 1925 Klemm L25. Around the corner to the registration area where I first sighted the first ever production model of the Lamborghini automobile, the 350 GTV. A couple of weeks earlier I had met Fabio Lamborghini at the family’s private museum in Dosso (separate article on this visit to appear through the Overseas Action page of this web site) where I saw the prototype & was advised that this stunning example (below) was coming to Villa d’Este – well, here it is! The Ferrari 206 Dino was the next to foll out of a trailer. This particular example, in both ready to race, but Concours condition competed in several events in period, including the 1969 Targa Florio. Once warmed up, it sounded great roaring down the driveway of Villa d’Este. Access to the Grand Hotel Villa d’Este was made very restrictive on the Saturday, thus providing the right ambience for the judges to view the 49 entrants in a relaxed atmosphere. I estimate about 1,000 people (including staff) in attendance on this day, but that may even be an inflated figure! Appreciating where I was and the company I was to keep during this elite day I chose to wear the suit I had brought with me from Melbourne and a very good choice with most there very well dressed. There was even a dog, which one person commented to me must take the owner 1 ½ hours to groom before going out into public! But to the event, the weather, like the Mille Miglia the week before was not all that kind & the day continued with periods of light rain. It didn’t dampen the spirits of those present as both entrants, their partners & preparers had shaded and indoor dining available in the Grand Hotel building, and for the media we were treated to the well set up BMW Group Media Lounge. There were no trade stalls at the Villa d’Este, just a music band set up near, then under a tree. Very discreet and elegant. The organisers had a small ferry on stand-by to shuttle guests to and from the Villa Erba (where the Saturday part of th e “Days of Elegance” event was taking place), but some chose to use their own marine transport turning up at the hotels marina in quantities of Riva boats. Above is the stunning example of the Ferrari 212 Barchetta, on display next two a couple of Maserati, then a brace of Ferrari at the back of this section. The 49 cars were assembled in their class order, dotted around about half an acre of the Villa’s grounds. A small, but effective set up. The Concept Cars were lined up about 200 metres away toward the other end of the Grand Hotel building. The organisers hand-picked the collection of Lamborghinis to celebrate the marque’s 50th anniversary. I’ve mentioned the 350 GTV earlier, but parked next to this was the first of the 350 GT (complete with original badge, notice it’s not the yellow with black bull, rather one they took off a Lamborghini tractor as the bull badge was not ready in time), then the 350 GTS. Personally, I had never seen, nor known Lamborghini to have a convertible model in the ‘60s, and it’s little wonder as the 350 GTS on show is one of two made! A V12 powered convertible would prove a nice way to travel. Two more Lambos to turn up, the first was the 4000 GT “Flying Star 2”. This is a unique Coupe model, sized to fit your skis and snow equipment in the back. But, no display of Lamborghini is to be complete without the showing of a Muira, in this case it was a Muira SV. So the line up of these five rare Lamborghini cars was a treat, and no doubt a sight we won’t see anywhere for quite some time. 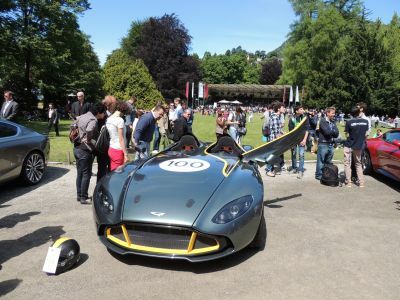 Diagonally opposite the Lamborghini cars was the display of Aston Martin, to honour this marques Centenary. 2-litre Sports ‘Spa replica’, DB4 GT Zagato, DB4 GT, DB4 SS & DBS. The DBS was the car that actor Roger Moore used as part of his role as Lord Bert Sinclair in the hit UK TV-series “The Persuaders”. 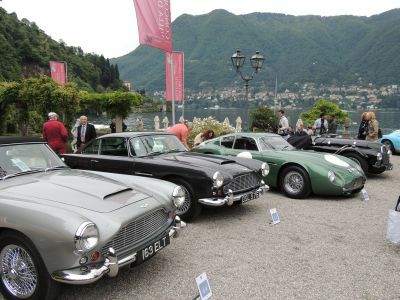 Photo: Part of the Aston Martin display, but with the stunning Lake Como as a backdrop. The Bandini on display was one of only 12 built, and bar far the smallest car there, infact it may even be small enough to fit in the back seat of the Isotta Fraschini 8A, positioned nearby! Don’t judge a book by its cover though, the noise from the big V8 engine under that small bonnet made up for the size, but can imagine would be a handful to drive. Opposite this, a stunning Fiat 8V Zagato, with an equally strikingly dressed US owner (in a very loud pin-stripped suit). The Ferrari 250 GT ‘Tour de France’ was on display for the first time in a couple of decades, following a recent restoration in the US. In fact, there were so many people present on this day from an English speaking background that the Master of Ceremonies when conducting the prize ceremony chose to do this in English. Thank you! It was good to see an Australian pick up an award here with the Briggs winning the best dressed in the style and era of the presented car award. 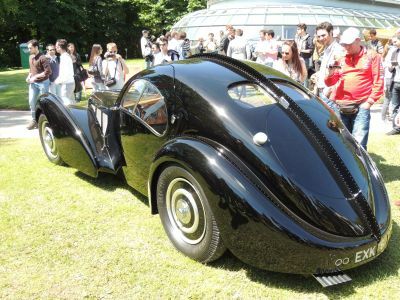 Ralh Lauren’s Bugatti T57SC Atlantic won the coveted Peoples’ Choice award. 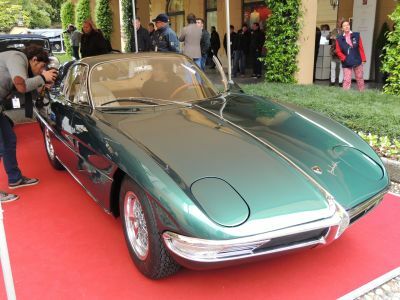 The Concorso entrants and Concept Cars drove from Villa d’Este to the Villa Erba early Sunday morning where they were spaced out around the ground, complimenting the existing displays of the motorcycles in their Concorso event, the BMW 90 Years Motorad exhibition, the auction cars, and a display of Corvettes. Yes, there were some trade stalls here, but I counted 4 in total. The weather was the best we had for the weekend with pure sunshine all day, no need for the umbrella or jacket! 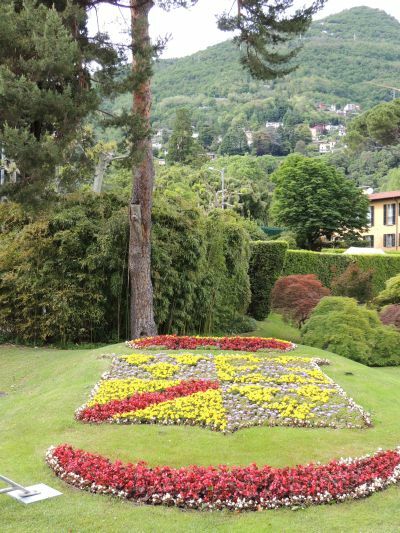 And, a lot more people than the previous day at the Villa d’Este with estimates floating around of 10,000 spectators – that’s nearly twice the population of the Cernobbio Township. It’s the detail of how an event is put together is what I most enjoy about travelling wide and far to visit an event, and the entire set up was done in fine detail, which one imagines has being continually developed since the Concorso was re-established in 1999. The signage, ticketing, a newspaper, and at Villa Erba sun-lounge style timber deck chairs came out by the dozen for entrants and guests, and were spread out across the 15 or so acres of grass the day was held in. A good touch, and well received by patrons. The BMW Group Media Lounge this day was located in the stunning 19th Century Villa Antica, a large two storey building right on the lake, and was the most surreal location for a media centre. Lavish rooms with detailed wall paper and painted ceilings, modern furnishings, staffed Espresso machines for a decent coffee (almost to be expected when you’re in Italy! ), and a gourmet cooked buffet (albeit served) lunch. This web site has cost a lot of money and time since I established it 10 years ago, but the rewards have come, yes enjoying a lunch! I met, and spent some time with Peter and Robyn Briggs from Western Australia and found out that although they sold off 80 cars from their collection recently, they have retained 70 and house most at the York Motor Museum. This MG K3 Magnette was part of Lord Howe’s team in the 1933 Mille Miglia, hence the grounds for their 2013 visit to Italy, 80 years on. Roger Scott, preparer of the 1980 BMW M1 (discussed earlier) was kind enough not only to show me the award he won, but also two gifts that every entrant gets for participating at Villa d’Este – a solid Medallion, and a Porcelain constructed model “paper-weight!” of car shapes. What an event, what an experience. Highly recommend any enthusiast attend as a spectator. At Euro 14 admission for the Sunday “Public Day” at Villa Erba, it’s well worth it. But unless you can obtain entry to the Saturday events at Villa d’Este you may be best to attend Cernobbio as a day trip, and perhaps explore other parts of Lake Como either side.